The aim of my study 1 is to understand the role of South African cities in the transport flux and networks, and how cities and transport are interacting, from colonization in the 17thuntil nowadays. If cities and transport interactions are a particularly interesting approach to understand the metropolisation process and the urban system building, the South African context makes it even more relevant. Indeed, South Africa is a young country and national transport networks such as the railway network, have been built while the urban system was formed. The arrival of European settlers in 1652 to the Cape of Good Hope marked the beginning of South African modern history, in particular by initiating the urbanization process. Until then, no city, strictly speaking, existed yet (Coquery-Vidrovitch). The implementation of a settlement engaged the constitution of an urban system well connected with Europe, but not very well between cities (Vacchiani-Marcuzzo). The discovery of the goldfields and diamond mines in the 1860’s overturned that system. In the heart of the mining region, Johannesburg faced a fast growth to become the biggest metropolis in the country. The emergence of this new centre deeply modified the urban structure by switching the country’s centre of gravity from the coast to the Witwatersrand. Indeed, the British Empire decided to experiment inner-city railways in Cape Town and Durban in the 1860’s. But given the mining revolution, the decision to extend it to the entire country was quickly made in order to dispatch the mining extractions from the Witwatersrand plateau to the shoreline before having them exported to Europe. Hence, in a bit less than 100 years, a 20 000 km railway network has been built. The implementation of such a network whereas the urban system was formed enables us to talk about a co-evolution of urban system and transport network in South Africa. Citie’s growth has largely been influenced by their position on the railway network. Large cities benefitted from a better accessibility, which reinforced their centrality while small towns had to deal with the simplification of urban hierarchy. 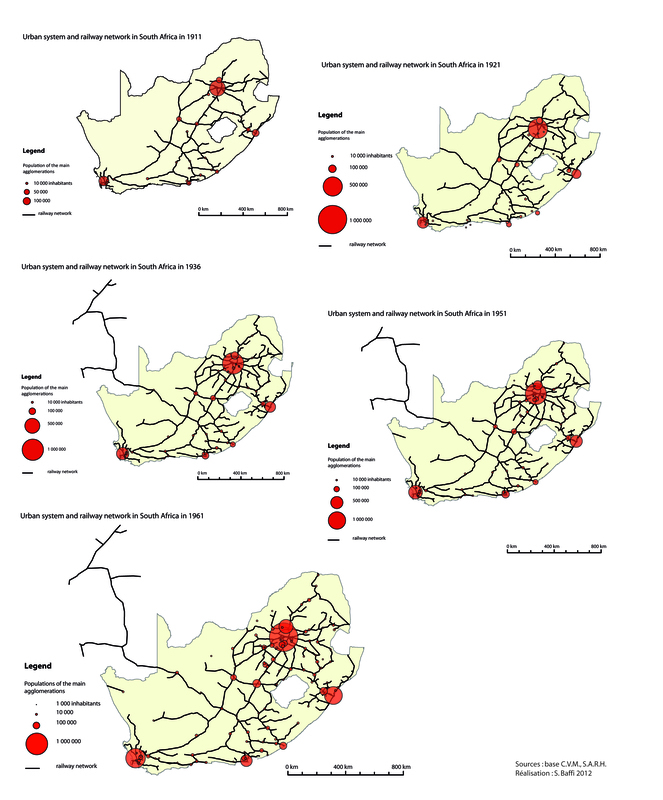 As in many other countries, we can notice the strong interaction between cities and transport and its effect on the process of cities selection, particularly reinforced by the railway network in the South African example. I started my research by focusing on the railway network given it seemed easier to start with an historical approach at the larger scale. To observe and study this co-evolution we decided to cross two databases created in Geographie-Cités. The first one, built in the research program Harmonie-Cités, gathers data about the evolution of South African cities (of more than 5 000 inhabitants) over almost a century. To create this database, South African censuses have been used. The second one, made up in the frame of Geodivercity research program, contains data about the railway network’s development in South Africa and has been built thanks to the SARH archives. By crossing these databases, we created maps over 60 years which show the concomitant evolution of the urban system and railway network. Now, I intend to deepen my analysis and enlarge my focus to the implementation of transport in metropolitan areas on one hand, and the position of South Africa in global networks on the other. An indicator of power as being the difference between relations going out and relations entering, relativised by the total number of relations. The principal component analysis brings out two main dimensions, which focus on 80% of the information contained in the data. The first factor, representing 62.5% of the information, distinguishes between the cities according to their attractivity and their local and global centrality in the network (inter-urban dimension). The second factor summarizes 16.5% of the information, opposing small and middle-sized cities benefiting from a strength associated with their strong intra-urban connectivity to cities with a large population but less attractive (intra-urban dimension). The ascendant hierarchical classification identifies 6 classes of cities, and a Chi2 test confirms a significant relationship between the continental membership of the city and its classification. Class 1 is represented by small to middle-sized cities with weak centrality and weak attractivity. This class brings together 70% of the cities in our sample. 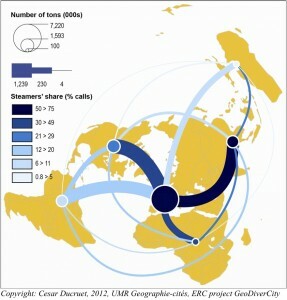 All the continents are represented in it in a homogeneous fashion. Class 2 is made up of cities with a strong population and weak scores for attractivity and centrality in the network. It brings together 33 cities ; the Asian cities are over-represented in this class : they represent 2/3 of the group, followed by the cities of South America, also over-represented (7 cities). Class 3 describes small to middle-sized cities, controlling (strong indications of power) with a strong intra-urban connectivity. The European cities are largely over-represented, as they represent 70% of the group (119 cities). The Asian and South American cities are under-represented. Class 4 represents middle-sized cities with strong indications of centrality. 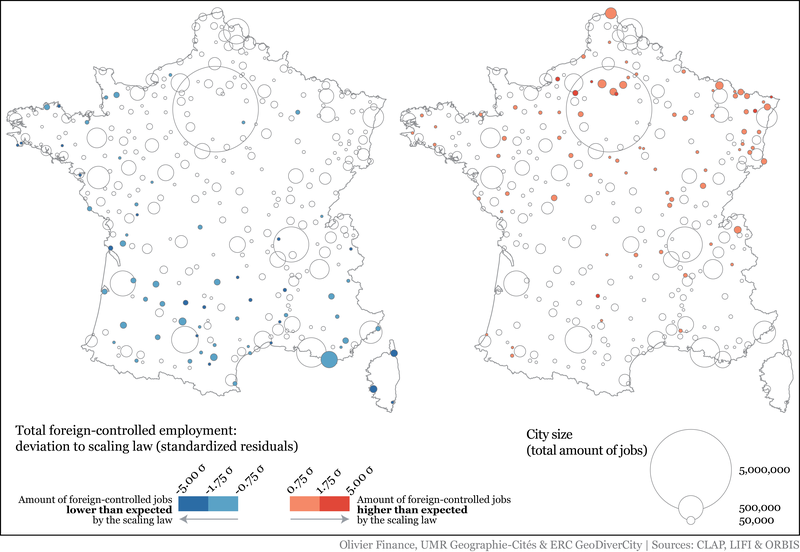 Once again the European cities are over-represented, they represent 70% of the group. Class 5 defines cities with very strong centrality indications of degree and of ‘intermediarity’ (Betweenness). 12 cities belong in this class: 5 European cities, 3 Asian cities and 3 North American cities; 1 African city (Johannesburg). Class 6 describes the cities of Paris and London, which have an exceptional position in the network, with a very strong betweenness centrality, and of relatively weak ‘in-and-out’ degrees. These results demonstrate that the cities do not have the same attractivity in relation to their population size. With equal populations, the parameters of the power functions of the scaling laws of the systems of the North American and European cities are twice as strong as those of the system of Asian cities. These relationships demonstrate that the economies of agglomerations are superior in the North American and European cities, which is probably linked to the quality of their infrastructures, to the diversity of their economic actors, and to their position in the global value chains. 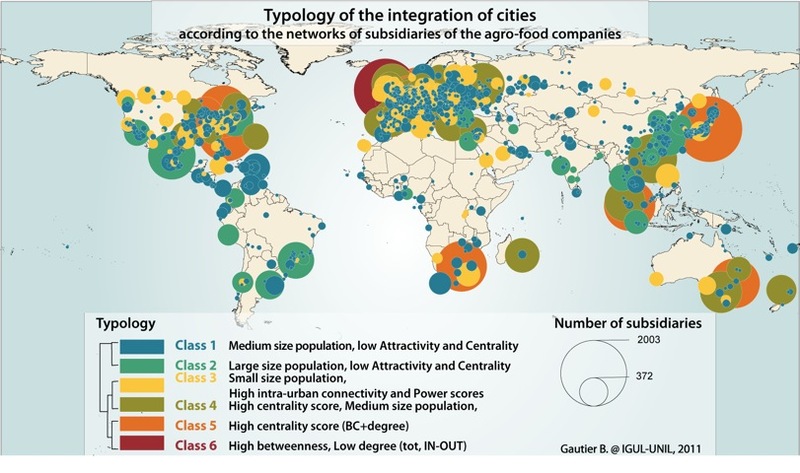 This typology also brings to light a strong centre-to-periphery structure, with at its head, London, the cradle of the food-processing industry, the most attractive and central city; then Paris, less attractive than London, but which plays the particular role of international bridge in the agrofood companies’ networks. In the second position are found some international cities that are integrated and central, but whose influence varies from the intra-continental scale to the national scale. The periphery is defined by the cities of Groups 1 and 2. Not surprisingly, the cities of this group are for the most part located in poor countries : most of them being Asian cities, cities of Africa, South America, and the Pacific coast of the North American continent. The aim of this series of models 1 is to study growth regimes of systems of cities, which are defined by the nature of the interaction between the cities. Three different stages of urbanisation are considered as resource accessibility, which plays a major role in growth dynamics, takes different forms. For each stage, a set of stylized facts characterizing the state of the system and urban growth dynamics is proposed and defines the structure of an ABM model. The SimpopLocal model tries to characterise a stylised dynamics of urban emergence. This first urban regime is defined by the role of local environmental constraints on growth. Central to this model is the notion of landscape carrying capacity. Settlement sizes and their growth are controlled by the amount of resources locally available. But innovations and their diffusion in the system thanks to interactions between settlements help to overcome those limitations, eventually producing the proto-structure of urban systems. The SimpopNet model characterise the progressive networking of urban economies. 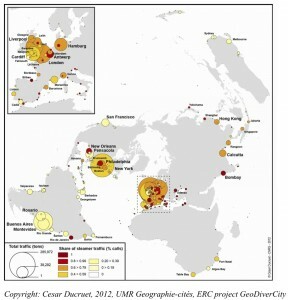 Innovations in communication and transport networks allow the trade and long distance diffusion of goods and techniques which enables cities to overcome, by importing what was lacking, the local constraints and climatic hazards that limited their growth. In this regime, the resource accessibility of each city is defined by its situation in the network. The SimpopNet model simulates the co-evolution of urban systems and transportation networks. The SimpopClim model will represent a dynamic regime that takes into account the impact of global environmental constraints on urban dynamics. This PhD is made possible thanks to interdisciplinary work with computer researchers participating in the GeoDiverCity programme, hired after previous collaboration with ISC-PIF (Romain Reuillon and Mathieu Leclaire, http://www.iscpif.fr/) and a PhD in geomatics conducted by Sébastien Rey Coyrehourcq. The SimpopLocal and SimpopNet models are used as case studies for the development of grid exploration procedures and protocols with OpenMole (http://www.openmole.org/). Those explorations and validating tools are designed to meet the validation and reproducibility requirements and to be generic and adapted to the exploration of spatial simulation models. 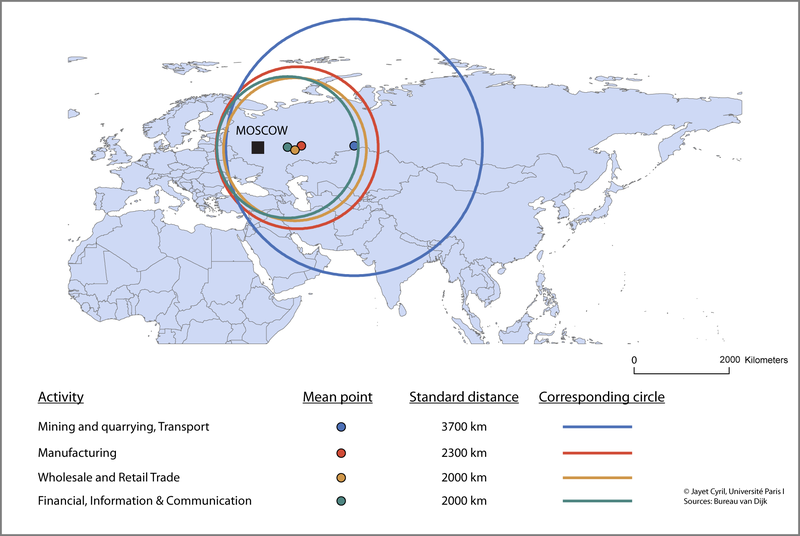 This map is made out from an analysis of the multinational firms’ networks in Russian cities (ORBIS database, Bureau van Dijk, 2010; C. Rozenblat). The links between owners and subsidiaries are aggregated into urban agglomerations, and differentiated by activity sectors (NACE). Company groups working in Russia have been constituted : chains of ownership were formed where subsidiaries are owned with a share of at least 50%. The map shows mean points and standard distances of head groups’ locations in Russia. The more we travel East from Moscow, the less the share of added value in production: The barycentre for finance, information and communication activities (that is : advanced or metropolitan services) is the most western one, the closest to Moscow, and their standard distance is 2000km; further to the East is the barycentre of trade groups, similarly scattered, followed by manufacturing industries, that are less concentrated; eventually, mining and transport groups have a remote gravity centre located at thousand kilometres to the East, with the largest spatial dispersion.